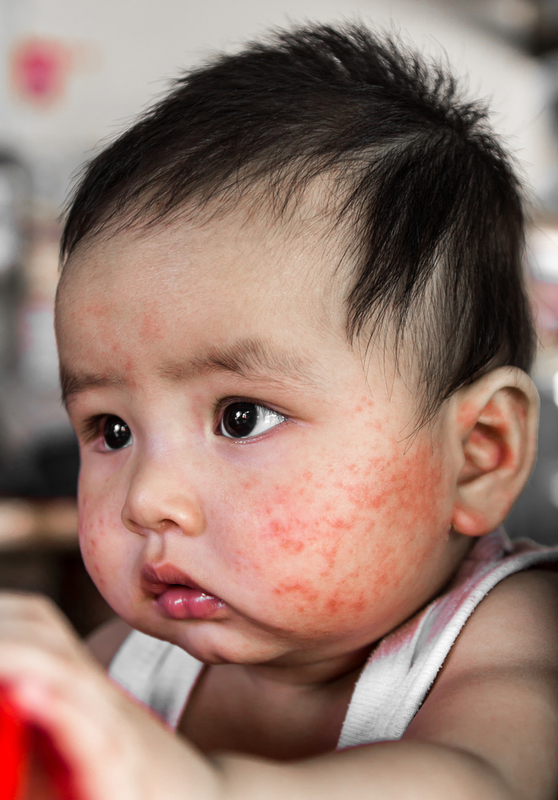 Eczema, also called atopic dermatitis is a common skin condition affecting 3 – 5% of children. It is one of the most misunderstood and difficult conditions to manage. It often starts during infancy and can be particularly frustrating. There is no cure, but with proper understanding and management can be controlled. About 85% of will grow out of eczema by the time they are 5 years of age. The following discussion will help parents understand and manage their child’s eczema. There are two problems that are the basis behind eczema, dryness and inflammation. Dryness is due to a defect in a gene that produces a protein called filaggrin. This protein binds water in the skin and so defective filaggrin results in dry cracked skin. Anything that dries the skin will exacerbate this problem. Inflammatory response to irritants. When the skin is dry it cracks allowing proteins and chemicals to penetrate the skin. This causes localised tiny ‘allergic’ reactions resulting in redness, itch and swelling. These irritants include things called aero-allergens such as house dust mite, cockroach cells, pollens, moulds, and animal dander. In 20% of moderate to severe eczema food is a factor. These two problems are targeted by the current treatments. Infancy – During the first few months the face, neck and chest will be involved. The skin will be dry, red, inflamed and itchy. The infant will become upset and rub his or her face to relieve the itchiness. Over time inflammation will move to the trunk, elbows, ankles, wrists, and knees. These are the more traditional sites for eczema. Early Childhood – This period can be very frustrating as toddlers fight their eczema and also resist attempts by parents to treat. Sleep deprivation is a common problem and studies have shown this condition can have a significant impact on the function of the family as they battle with eczema lack of sleep and the myriad advice that is offered. 5yo and beyond -as the skin matures the eczema will start to settle, with occasional flaring and skin infections. Usually bacteria such as staphylococcus are the primary bacteria responsible for infection. Sometimes this is caused by viruses such as the cold sore virus, and molluscum contagiosum virus. These can be quite nasty and difficult to treat. It is important to realise there is no cure. Eczema can be controlled but this requires dedication and compliance. Easier said than done especially in a fiesty 2 year old who is sick of the ointments and creams. Problems occur when therapy is stopped as soon as the dermatitis clears in the belief a ‘cure’ has been achieved. When the inevitable relapse occurs parents may abandon further therapy. Avoid irritants and Allergens: Use bath oils and no soaps. Dress your child in loose cotton and be careful of overheating. If you suspect irritants such as dust mite, foods then these can be tested for. But this is not always straight forward. In the more moderate or severe cases it would be reasonable to assess for specific triggers that can be controlled such as diet. Skin prick testing or blood tests can sometimes help to differentiate some of these triggers but this is a complicated area. Moisturisers: diminishing the inflammation requires the use of emollients and ointments. Two to three times per day is sometimes necessary with an appropriate moisturiser. They are applied over the steroid ointments as often and as thickly as you like. Tub and jar moisturizers are preferred to pump packs because they contain less water. Examples are QV intensive (kids balm), cetaphil moisturising cream, Hamiltons eczema range and Epaderm. Some moisturisers can sting when applied and cause a brief increase in redness. Changing brands is sometimes useful. Tea tree, vitamin E, Paw Paw and aloe vera can cause irritation and redness contributing to eczema. They have no benefit in treatment. Steroid creams: These are needed for flare ups. Steroids are very successful and very safe if used as directed. Parents should use cortisone creams as soon as they see a flare of dermatitis. Waiting until the dermatitis becomes significant results in more steroid use. For the face 1% hydrocortisone should be applied twice per day during flare ups and as the eczema improves slowly weaned. For the body include: Advantan ointment, Diprosone, Betnovate, Egocort, elocon (Sometimes stings). The advantan is a weak steroid that converts to a stronger steroid when in contact with inflamed skin. These should also be applied once daily and can be used under wet dressings – see below. Infections: Damaged skin makes it prone to bacterial and viral infections. Staphylococcus aureus is a common bacteria that complicates eczema. It actually prevents topical steroids from working, by changing the steroid receptor on the skin. Sometimes oral and topical antibiotics are required in resistant eczema. Bathing in a bath with bleach, pool salt and bath oil is extremely effective in eradicating this bacteria. This is similar to swimming in a chlorinated pool. See handout on impetigo for staphylococcus treatment. The herpes virus that causes cold sores can also result in a nasty skin eruption. These look like little blisters and if extensive require treatment in hospital. Eczema is one of those illnesses where false claims are made by alternative practitioners. They are not experts, and have no training in eczema. An analysis of all treatments have found that Western medicine is by far the most successful at treating eczema. There are no magic oils or creams that eliminate or cure eczema. As eczema improves with age and often improves quite suddenly many parents will mistakenly believe they have found a cure or identified some dietary trigger that has resulted in the cure. Eczema will improve as the skin matures and ‘keratinises’ preventing irritants from penetrating the outer layers. Vitamins, minerals, and fish oils have no effect on eczema. The exception to this is Vitamin D. There is some evidence that low vitamin D levels increase the chance of eczema. There is a general trend in society that tends to be highly suspicious of doctors medication. This has resulted in the current steroid phobia that currently exists amongst parents, shop assistants, alternative practitioners baby health nurses and even pharmacists. The myths surrounding steroids are quite alarming and generally have no basis of truth. What are the common triggers ? These include anything that dries and irritates the skin. Including wools, nylons, soaps, bubble baths, chlorine, house dust, pollens, grasses. Changes in heat, humidity, and also colds can trigger eczema. Overheating and sweating is one of the most common triggers. All this is compounded by scratching which breaks the skin surface and increases the inflammation. It is true that food in about 15% is a trigger. However this is often overstated. The common foods include cows and soy milk protein, eggs, shellfish, wheat and foods containing salicylates such as fresh fruit and tomatoes. Peanuts are also a trigger. In those where food is identified as a trigger, it will be only a part of the picture. Bath time – Bath your child once a day in cool water using a bath oil rather than a soap. Bath 2 hours before bed time and make it a pleasurable experience. Do not spend too long in the bath as water is drying to the skin. Bath oil or moisturiser can be applied to the bath and the skin before the bath. Bleach baths are effective in protecting the skin against staphylococcus infection. Swimming – Apply moisturiser and/or bath oil to the skin and shower afterwards to remove chlorine or salt. Occasionally needs to be stopped if flaring of eczema occurs. Clothing – Can be irritating to the skin especially if it has a “prickly” feeling to it or there are tags and labels. Avoid wool particularly against the skin, soft cotton or cotton/polyester is best in direct contact with the skin. When your child is hot from activity, environment or clothing the clothing will be more irritating to the skin than normal. Take a layer of clothing off prior to exercise. Beware furry toys, bunny rugs, car seat covers, and clothes the parent wears when carrying the child. Dermasilk (dermasik.com.au) is a low irritant clothing that is also antibacterial, and is worn at night time. Bedding – Soft cotton and satin are the least irritating. Again avoid overheating at night and use cool cotton one piece pyjamas . Mittens or splints are occasionally needed if scratching a problem. Dummies – Usually aggravate eczema around the mouth. Eczema sometimes gets worse during teething possibly due to a change in the immune system reacting to the gums. Detergents – Certainly aggravates eczema. Try to use LUX or Velvet and a good rinse. Bandages may be washed in the machine using a good rinse cycle. The presence of vinegar, 15mls in the wash will bring clothes to a pH that is close to the skin. Sleeping – Itch will become worse if your child is hot and there is a flare up. Often a mild sedative is useful and occassionally you will need to apply wet dressings in the middle of the night as a soothent. If dust is a trigger then a mattress and pillow dust cover is a good investment. Do not overdress your child. Scratching damages skin and increases infection. keep fingernails short and coat with bactroban. Scratching is worse when the child is upset. Distraction is a good way to stop the scratching by taking his/her mind off the skin. When scratching gets attention the behaviour is more likely to be repeated. Avoid always telling the child to stop scratching, rather, use distractional activities, especially ones using the childs hands. Positive language should be used as often as possible to the child. Eczema is influenced by many factors. Just as the skin is improving it may become worse again for no obvious reason.